I've been with SAH since 1999 (wow, I am dating myself!) and I think I am now a bit confused about how SAH compares/works with SETI in general since 20 years have passed, new SETI projects have been formed, new telescopes have been added, and other hardware and science has been created. Over the past 20 years I have seen a few videos on the topic of SETI and most recently one by Seth Shostak who is EXTREMELY inspirational, educational, and passionate. My question is, what part of the overall SETI pie does SAH contribute to? When I think of "SETI" I think of an overall, small community of scientists trying to find out if we are alone. Back in 1999 when SAH began, I thought that SAH was the big, single project that SETI scientists were investing in. Yet, I rarely (extremely rarely actually) hear the phrase SETI At Home and any mention of how SAH works. For 20 years I haven't heard a peep of SAH. Some side questions are: How does SAH utilize the Allen Array? How do other SETI projects leverage SAH? 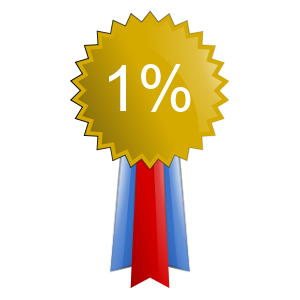 Is SAH 5% of the SETI research? If so, what projects are part of the other 95% of SETI research? How can citizens become involved? During the period from September 1998 through March 2004, Project Phoenix observed for a total of 100 days at Arecibo. That’s only 5% of the available time. The Allen Telescope Array offers SETI scientists access to an instrument seven days a week, and permits the search of several different targets (primarily exoplanet systems) simultaneously. As a result, the Allen Telescope Array is speeding up SETI targeted searching by a factor of at least 100. Ok...who is utilizing the ATA and who just sped up their search by a factor of 100? I am hoping SAH is not some pet project that faded into obscurity after 2-3 years and is just still ticking along only to provide a tiny sliver of information to the overall SETI research. The https://setiathome.berkeley.edu/sah_about.php page that is in the Science tab of this website (I think it really should be in the Project tab because it's not too scientific as currently described) doesn't answer my questions above. I'm not trying to sound pessimistic...just curious about SAH vs. SETI. Maybe my questions above are outlined somewhere on a webpage that I haven't seen yet...and maybe such a description should be duplicated on the SAH website somewhere. I see on ny sceensavers data coming not only from Arecibo, but also from Green Bank, the largest steerable telescope in the world. I look forward to see also data coming from Parkes and maybe from the Sardinia radio telescope in Italy. Message 1979131 - Posted: 7 Feb 2019, 17:27:21 UTC - in response to Message 1979113. When you saying SETI I think you mean the SETI Institute. As for seti@home . It started as an experiment to use Distributed Computing as a mean to "crunch big data". First with data from radio telescopes searching for artifical radio waves from outer space. 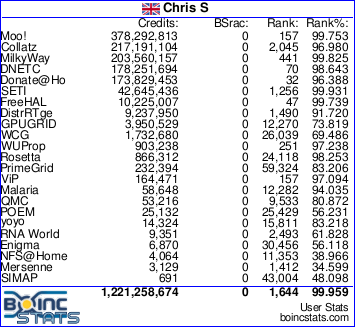 But then starting BOINC to also crunch data from a lot more different scientific fields. I suggest him to read the NASA Technosignatures article in the News section. Message 1979141 - Posted: 7 Feb 2019, 18:03:55 UTC - in response to Message 1979137. Let me point you to https://seti.berkeley.edu/ to see where Seti@home fits into UC Berkeley's seti plans. Beyond that I can't say there is a body directing the various groups to look here or look there. Many time the data which appear on my SETI@home screensavers have the label BreakthroughListen together with SETI@home. That is the initiative sponsored by Yuri Millner and other wealthy people which makes use of Green Bank, Parkes and the optical Lick project. There is evidently a relationship with SETI@home also because dr. Siemion, head of Berkeley SETI, is also connected with the SETI Institute. The SETI Institute is more known that SETI@home, but we have about 90000 active members, I don't know about them. Moomin is basically correct in that Seti Classic which began in 1999, was an experiment to determine if distributed Computing using the general public's computers was a viable proposition for a scientific project. I very quickly proved that it was. So much so that other scientific projects wanted to use the same mechanism for their subject as well. BOINC was born in 2004 and was more robust than Seti Classic where it was too easy for those who wanted to cheat to do so. About 18 months ago David Anderson wrote a report that said that like all experiments it needed a beginning, and an end, and a conclusion. The conclusion was that after 18 years we hadn't found anything. But DA said that S@H would continue but maybe in a different form. DA started up Nebula as the new back end planning to use the Einstein cluster at Hanover. Since then the Breakthrough Listen Project has started up with significant private funding. S@H is still going strong but the active 5% of users is very low. Eric also posted that unfortunately, Parkes took down the multibeam feed we were using for the galactic plane survey and put up the wideband feed. That put a bit of a hitch in our plans to utilise Parkes data. Message 1979187 - Posted: 7 Feb 2019, 21:51:48 UTC - in response to Message 1979161. Thanks, Chris. I heard about Breakthrough Listen Project last Fall...but it does not seem to be a Distributed Computing project. In addition to SAH, are there other (newer/better?) SETI projects that I can join? I'd still love to participate with SAH but if it's ending, I'd like to pour my resources into the next wave of Distributed Computing for SETI work. Message 1979188 - Posted: 7 Feb 2019, 21:55:27 UTC - in response to Message 1979187. Message 1979189 - Posted: 7 Feb 2019, 21:57:34 UTC - in response to Message 1979188. Message 1979194 - Posted: 7 Feb 2019, 22:49:00 UTC - in response to Message 1979188. 1)How do you know I've been doing a lot of blc work? 2)How do you know I've been doing a lot of work in general? I see my RAC but I don't see any page that says "this particular computer did 719 work units, 525 of which are blc" for example. I don't mind sharing my stats but I would love to know the URLs or clicks you are doing to see the stats you are seeing. The Tasks and Details hyperlinks don't seem to tell me how many blc work units I am doing for a particular computer. Message 1979200 - Posted: 7 Feb 2019, 23:32:21 UTC - in response to Message 1979194. From this page you get your account info. Press View "Computers on this account". From this page you get your computers. Then Press Tasks for computer 8667189 for example. Message 1979204 - Posted: 8 Feb 2019, 0:17:23 UTC - in response to Message 1979200. Ok...I see it...other WUs I click on do not have the "blc" in the beginning so I must be getting some non-blc too (which is fine). Chris deplores the fact that only 5% of registered users are active users, but that amounts to 90000 people spending time, money and electricity to look for a signal whose chances are minimal. I am taking place also in other searches. The Higgs boson was conceived in 1964 and detected at CERN in 2012. The gravitational waves were conceived by Einstein in 1915 and detected by LIGO and VIRGO in 2015. What motivates SETI users? A book was written before the detection of GW to explain why people search for waves so feeble that Einstein himself declared they would never be detected. Message 1979244 - Posted: 8 Feb 2019, 4:24:49 UTC - in response to Message 1979237. And until CreditScrew and the way SETI handles computers with GPU's here is fixed when running stock then trend downwards in participation will continue only until it's only us diehards left. That was posted by Wiggo not me! I wouldn't say deplores, I would say increasingly disappointed that the gloss is rubbing off the project compared to some years ago. But it is not surprising. Nitpicker never happened, we've never found anything in nearly 20 years, Breakthrough listen didn't give us any money out of the $100 million allocated to the project, and Nebula seems destined to end up like Nitpicker. Partly because DA's main job is as Director Boinc. But no, S@H is NOT shutting down it is continuing. As DA suggested, by using new and different dishes for the source of data. Although the setback at Parkes was a shame, they themselves have to accede to the wishes of the people that fund them. As has been said, we are being used to sift through some Breakthrough listen work. Seti Beta is still running, but as effectively no development work is being done there is often periods of no work. Wiggo is correct. Creditscrew the infamous new method of awarding credit, has seriously pissed many people off, to the extent that yes, only the diehards are remaining. And many of them are not replacing machines as they die or doing much upgrading.. I run a small farm of 6 computers but they are now on other worthwhile BOINC projects looking for cures for amongst other things Alzheimers, Huntingdons, Parkinsons etc. On a pension I want to make sure that the money I spend on electricity is doing the best for mankind that it can. If things materially change I will come back full time, but until then I'll just dip a toe in the water now and then to maintain a minimal RAC. Bear in mind also that the lads in the Lab don't spend 5 days a week on S@H, they also work on other UCB projects. So lack of staff. lack of money and resources, plus no results in nearly 20 years, have all contributed to the current doldrums. Us original participants trail blazed the way forward 20 years ago, but we have been overtaken by others with more money and resources and more effective PR. And bearing in mind that the Seti Institute started up in 1984, some 15 years before we did. Even though my statistics show I have only been participating since 2010 I have actually been a member since 1999 when the whole thing started. In 2010 I moved and had to rejoin. I never figured out how to merge my accounts so approximately 10 years of my contribution to the project are missing. Getting credit for that isn't high on my priority list so it doesn't worry me. In 1999 I really thought that it would only take a couple of years to find E.T. Since then the reality of the nature of the search has set in, but as long as seti@home stays active I will participate. 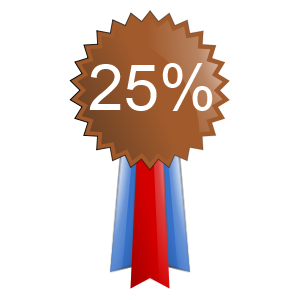 Message 1979305 - Posted: 8 Feb 2019, 13:03:43 UTC - in response to Message 1979267. What worries me most is that from what I understand--if we actually had results we would not know it. I continue to crunch even though i have to stop to get my printing done expeditiously or my spread sheets to load. I keep enough RAC so that I can post my crackpot theories on the boards and converse with other kindred souls. I actually believe that a small, inexpensive group of GPUs attached to the antenna could Vet the data in real time or nearly real time and discard most of it--The GPU's may even be fast enough with enough horsepower to look inside for modulation and signs of intelligence in the signals received. Though I admit rampant ignorance --I also believe that if all the people, equipment and money devoted to SETI were pooled and managed (perhaps at least at Berkley) then a truly proper job could be done--I still wouldn't expect any success in finding ET--but you never know. We would all like to feel that we are not just polishing turds as we see in so much sponsored research these days--funded by scientifically unsophisticated sources. Yet another good rant by Daddio ! !